Are you late with turning in your paper? Trying to fool your teacher with a lame excuse? Corrupted Files can help. Don't hand in a 'garbage' paper. After purchasing a file, rename it an email it to your professor along with your 'here's my assignment' message. 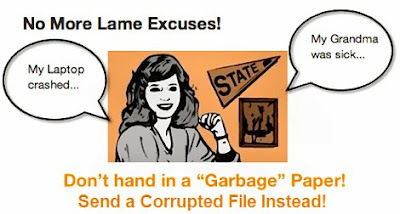 It will take your professor several hours if not days to notice your file is 'unfortunately' corrupted. Use the time you just bought wisely and finish that paper.